No day is the same, but every day is an adventure! Some days I sleep in and some days I don’t sleep at all. But the one thing that always stays the same is my love for the beauty North Dakota. If I know I have along travel day ahead of me, I always make it a priority to get myself a big cup of joe and leave about 45 minutes early. Why 45 minutes you ask? It’s because Suzan (My GPS) always gets me lost… but mainly to make sure I find myself in the middle of nowhere to pull over and take in the sunrises each day. Days go by incredibly fast as Miss North Dakota, by taking a minute for myself and recapping on the previous day, week, or month, it makes the adventure carry on for a little bit longer. 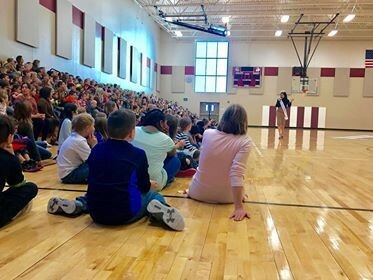 Some days I will have one appearance in a town of 367 people and a school that has 27 kids K-6 but only 21 attended because a few kids took on a cold. Other days I will have a day packed with 8 appearances, with 352 miles in my future alongside of impacting 2,500 students in one day. I could put on anywhere from 2,300 to 5,600 miles in a month, yes.. I did say in a month! With all the driving and busy schedules in my life, sometimes even I mess up which day that I am supposed to be presenting to a school. Like I said earlier, every day is an adventure.. and man this specific day was! After a late night of studying mixed in with daylights savings time, my eyes and head were foggy. I looked at my schedule and saw I need to be in Cavalier on Monday. Little did I know after driving 3 hours and a half hours, driving 10 miles with my car screaming at me “You are Zero Miles till empty,” and walking into the school that I realized I was a full day early. Nothing says fashionably early like 24 hours early! I simply said “ok, see you tomorrow!” On the inside I thought “what am I supposed to do now! ?” I had recently acquired my first passport EVER and then thought “Canada.. Ay! ?” So to Canada I went! I walked around downtown Winnipeg, visited some local shops, attempted to blend in with the University of Manitoba Students and sat in on a hearing at the Legislation building of Canada. After a good time spent in a foreign country, I felt it was time to head back to the mother land as I needed some rest before another trip to Caviler. With a busy schedule it’s important to find that balance with in your day. Some days can be harder than most, as a platform that talks so transparently about bullying and suicide, it can weigh on you. I sometimes ask myself, what more can I do to help these kids? And that’s where Running comes in! It’s my time to clear all the thoughts in my head, bring me clarity into my ideas and help myself debrief from a day. Little did I know something that I used to bring clarity to me is now something that I am will use to help me train for the Fargo Marathon. Yes.. I said that right! THE FARGO MARATHON! 26.2 Miles! 13 miles every other day! Am I crazy!? Maybe a little! But life is too short to not go on adventures and not try new things! Your evenings as Miss North Dakota are similar to the rest of your day, you simply don’t know what adventure is going to come your way. 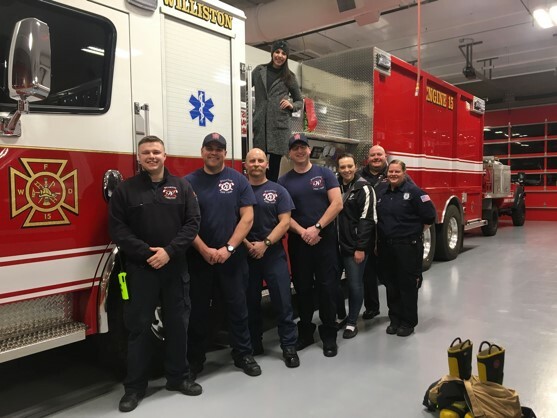 You could meet the Fire Chief of Williston at an event, get to tour all of the fire stations, hang out with the crew, learn how to play bag pipes from a volunteer fire fighter, and save a cat from a tree! (just kidding.. No cats were needed to be saved this day) or you could have a normal night at home studying for a midterm, eating Chipotle with your dog who does not like giving you any personal space after being gone for weeks at a time. Every day is an adventure and every day is a blessing but the most important thing to do in each day is simply enjoy every moment and have fun!! The job of Miss North Dakota is just like every other “normal” job, it has a lot of great days, a few off days, a few challenging days, and days that simply cannot be replaced. Life is too short to compare apples to apples and crowns to crowns, so as long as you are living with a frown that is upside down, you cannot go wrong.